roof your home. But first, why renovate? To make it more attractive to future buyers. Where you spend your money will depend largely on your motives for renovating. Here are some things it pays to consider when renovating your home to make it future-proof. Updating the kitchen offers great bang for your buck in terms of your property’s resale value. According to Domain, spending $10,000 on a kitchen reno could improve your home’s value by as much as $50,000! It can also go a long way towards improving the long-term liveability of your home. When planning the design, consider how your family’s needs may evolve over time. If you’re having more children, will you need a larger kitchen where everyone can gather? Would a breakfast bar be useful for informal dining? Perhaps energy-saving appliances are important to you in the long-run? Benchtops that incorporate dining tables into the design. Renovating your bathroom allows you to improve functionality, increase storage space, address problems like mould and leaky fixtures, and enhance energy efficiency. Even simple enhancements can make your bathroom more durable for years to come and add value to your home. If you can add a second bathroom, even better. Spa-inspired designs (heated towel rails and underfloor heating). When future-proofing your home, consider the communal living areas and how your needs might change in coming years. For example, you may like to renovate to include a second living room that could double as a toy room. This area could function as a study during the kids’ teenage years, then as a reading nook when you’re older. Upgrading the flooring or repainting the walls in your living areas are relatively inexpensive enhancements that can add value. Choose durable flooring to suit your family’s long-term needs, and neutral tones that offer wide appeal. Limit the use of carpet as it wears quickly. Don’t forget to consider renovations that could maximise outdoor living areas. Smart gardens (technology to water your gardens or turn your lights on via your phone). 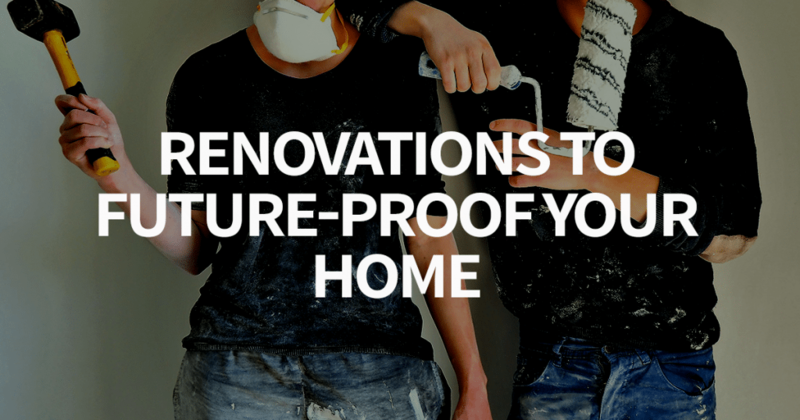 We hope you’ve found these renovations to future-proof your home handy. If you’re feeling inspired to renovate, your mortgage broker can explain your finance options. For example, you may be able to refinance and unlock the equity in your home to pay for your renovations. Get your renovation dreams off the ground – get in touch with your local mortgage broker today.